Green Meadows Golf Course opened Memorial weekend in 1973. Marion "Spitz" Eipperle and his wife Helen started turning a portion of their farm land into a golf course back in late 1971. Local farmers thought he was "crazy" when he started building greens in the middle of a corn field. Being determined, Spitz never slowed down on his project, completing it the fall of 1972. The course was designed by a friend, Harley Hodges, who at the time built, owned, and operated Whiteford Valley Golf Course. 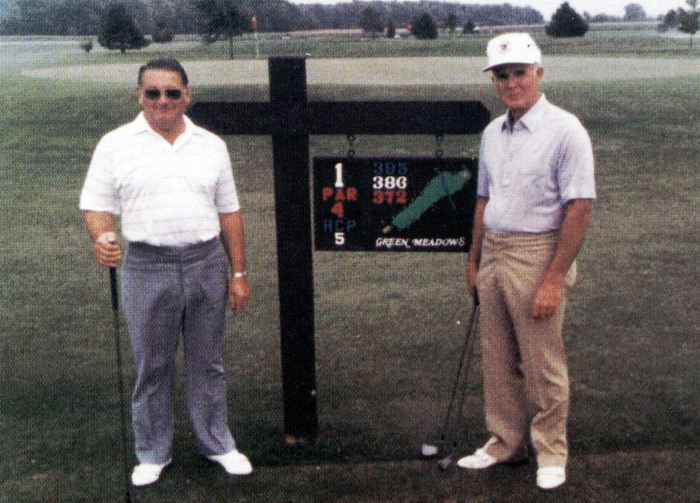 He gave Spitz many tips on owning and operating a golf course, which we still use today. Throughout the 70's and 80's Green Meadows attracted new leagues, outings, members, and high school teams. It took off faster than expected, so an addition on the clubhouse and a parking lot across the road was added, to accommodate the growing business. Over the past 40+ years we have been the home of both the Ida High and Monroe High boy's golf teams. Much of the success that Green Meadows has seen over the years is due to the family values and work ethics that Spitz and Helen have passed onto their children Kay, Tom, and Debra, along with son-in-laws Dale and Doug. All are involved with the business today, including the grandchildren, who too are a vital part of today's business. Not only did they pass these values and ethics onto their children and grandchildren, but also their employees. After the turn of the century more golf courses have popped up in Monroe County, creating many choices to play. We continue to strive to be the leader of value and service in golf in southeast Michigan. Green Meadows will continue to improve course conditions and characteristics, clubhouse amenities, and price packaging, to better serve our customers.